Wilbur Wright was responsible for designing the first successful airplane. 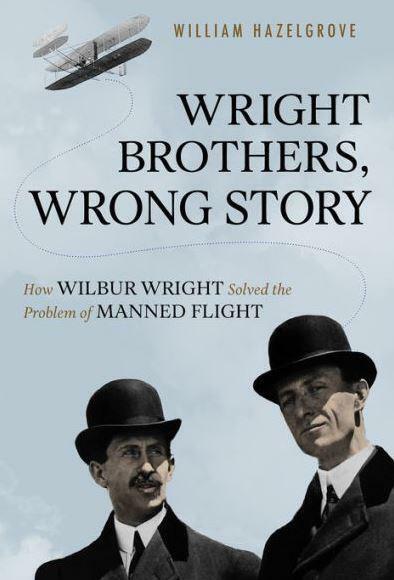 That’s the conclusion drawn by veteran journalist and best-selling author William Hazelgrove in “Wright Brothers, Wrong Story” (Prometheus Books), which makes a pretty convincing case that Wilbur was the Wright brother predominantly responsible for unlocking the secrets of manned flight. Hazelgrove contends it’s a myth that Wilbur and Orville were more or less equal contributors to the endeavor—and equally responsible for the results. Among other things, he reminds us that Wilbur died an early death in 1912 (from typhoid fever), so Orville was free to convey his version of events to Fred Kelly, who published the first biography of the Wright Brothers—“A Biography Authorized by Orville Wright”—in 1943. But it’s Wilbur’s voluminous correspondence with the leading aeronautical scientist of the day, Octave Chanute, which is the veritable “smoking gun,” according to Hazelgrove. 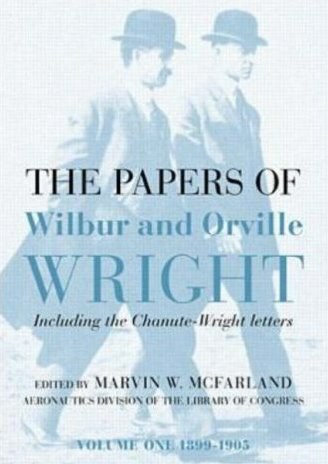 Indeed Wilbur and Chanute exchanged hundreds of letters (available in The Papers of Wilbur and Orville Wright volumes one and two). Those letters feature detailed discussions of technical challenges related to solving the problem of flight, and it’s quite revealing that it’s Wilbur (not Orville) that does all the talking, so to speak. Having written a longform look-back at “the remarkable achievements of the Wright Brothers” titled Get Your Wings—published in Failure in 2003 to correspond with the centennial of first flight—I couldn’t resist the prospect of further exploring Hazelgrove’s line of thinking. Hence the following Failure Interview, which includes discussion of my favorite insight from the book—about a relatively little-known turning point in Wilbur’s life, which occurred when he had his jaw shattered with a hockey stick by Oliver Haugh, a future serial killer, who, decades later, would be executed for killing members of his own family. What inspired you to explore the Wright Brothers’ story? So I asked: ‘Who are these guys? Who are these guys, really?’ And I saw that no one had written a biography of these guys that departed from the Wright Brothers myth. So that was my motivation. When I wrote my book proposal it was sorta vague, ’cause I said ‘I think there’s a real story here, but I’m not sure what it is yet.’ But my view was these guys were flesh and blood and they weren’t the same. So I got “The Papers of Wilbur and Orville Wright”—two huge volumes—and I started going through them. Right away what jumped out at me is the fact that Wilbur Wright was the guy—that this was his quest. He was this very intelligent man who had an interesting mind that could pick up on technologically complex engineering concepts. It wasn’t Orville, who was mechanically inclined and had his own kind of brilliance, but wasn’t [responsible for] the bolt that allowed somebody to go where no one had gone before. It was Wilbur who orchestrated the whole thing from the beginning. And it was through a strange set of circumstances that he started to think about solving the problem of flight, when in fact he had no training at all. Since you mentioned that strange set of circumstances, let’s talk about Wilbur suffering a broken jaw and lost teeth when he was hit in the face with a hockey stick—by a future serial killer, no less. What happened and how did the incident change Wilbur physically and mentally? Oliver Haugh was a psychopath and a bully in the neighborhood who would later become a mass murderer and be executed. 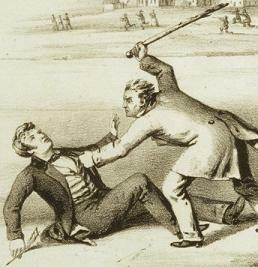 At the time of the incident Wilbur was seventeen years old, very popular in high school and headed for Yale, but he was playing hockey with Haugh—who was hopped up on cocaine tooth drops, among other things—and Haugh took his stick and shattered Wilbur’s jaw. There was a lot of physical pain involved, but the incident also affected Wilbur psychologically. It’s almost like evil came into his life for the first time. Also, Wilbur’s mother was dying. He became his mother’s nurse and went through a deep, three-year depression. But during this period he started to read about flight and decided that he wanted to solve the problem of flight. He’s the one who wrote to the Smithsonian and said, ‘I want to know everything you know about flight.’ And he’s the one who contacted the weather bureau to find a place where there would be constant wind. He’s the one who contacted Kitty Hawk and he is the one who built the first glider and the Flyer. Yes, there was some assistance from Orville but it was his project and he initially went down to Kitty Hawk by himself. So this horrible incident led to a total alteration of his life, at which point he took on this incredible quest to solve the problem of flight, which no one up until then had been able to do. What accounts for the Wright Brothers’ history being passed on to us as it has? First, historians generally repeat themselves. Also, the Wright Brothers became these august figures. It became blasphemous to say what my book says, which is that Wilbur Wright invented the airplane. He was the one who corresponded with Octave Chanute—they exchanged hundreds and hundreds of letters—and he worked out the head-cracking physics of the lift coefficient for wings. But for a long time after Wilbur died, no one wrote anything about how the plane was invented. John Kelly, who was very good friends with Orville, finally got the go-ahead, though Orville insisted on approving every single page. So Kelly had to write a book that was pleasing to Orville, and the first thing he had to say was that everything was 50/50. The book, which was published in 1943, became the bible of the Wright Brothers and it [essentially] said that the brothers were identical. In fact, [it hinted that] Orville Wright may have even been more talented because he flew on the plane on December 17, 2003. He was seen in that famous photo that showed Orville in the air [and led people to believe] that he was the one who invented the plane. This was handed down to historians and nobody deviated, including David McCullough. Many of the other pioneers of aviation died pursuing their quest. How did Wilbur—and Orville—avoid that fate? They avoided it by going to Kitty Hawk and taking it one step at a time. Also, Wilbur didn’t fly very high; he kept low, because he was cognizant of the men who had tried to fly and killed themselves. [Keep in mind that] Orville did not fly until 1902. 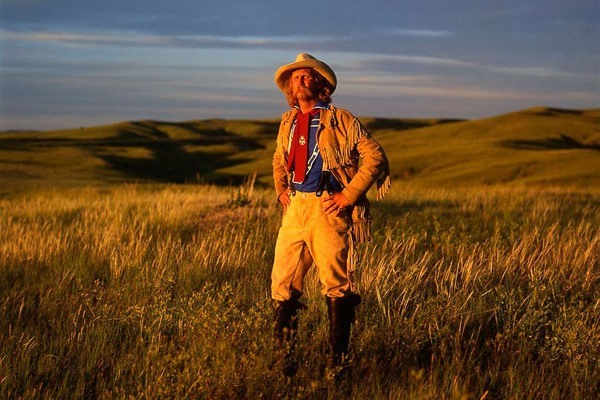 Wilbur had made a hundred flights before that, so he was the real pioneer. He would launch off a big dune at Kill Devil Hills and catch the wind and go. But he would do it in a controlled fashion and didn’t get ahead of himself. A lot of guys who died in accidents assumed that each flight would allow them to fly higher and further. But they didn’t understand control. So when they would fly it would be a fluke and they would try to replicate it by going higher and further and would get themselves killed. But Wilbur was very meticulous; he took nothing for granted and never let his ego get in the way. Kitty Hawk allowed him to experiment at low [altitudes] with constant wind and have soft landings because of all the sand. There were near-misses; in fact, there were a lot of close calls, but he didn’t go too high or get ahead of himself with his experiments. On a related note, how did a lack of resources play to the advantage of Wilbur—and his brother—in terms of learning to fly? Because Wilbur had no money he couldn’t hire people to help him. And most everybody else—including Samuel Langley, Secretary of the Smithsonian, who received $50,000 from the government to build a plane—were focused on power and believed you needed a lot of power [in order to fly]. But from the outset, Wilbur understood why people hadn’t been able to fly—that it was a problem of control. To get that control you need a certain amount of lift, and to be able to move the wings. So he started looking at birds and at how their wings flex. Wing warping was part of the control problem. So the fact he had no resources meant he could not go on any assumptions. What he discovered when he went to Kitty Hawk is that the lift coefficient was totally wrong [and he went forward with his own calculations]. In the book, you write about how Wilbur was on the verge of becoming a failure in the game of life, and that if he didn’t solve the problem of flight it would be another failure in a list of failures. So it was a high-risk, high-reward scenario he set up for himself. But he had to do it all-or-nothing because that’s what makes it happen. But he was looking at being almost 30 with no relationships and no real accomplishments, which for a guy like Wilbur could have been devastating. On the other hand, Orville would have been fine; he was more of a business guy. Tell me about Wilbur’s quality of life between the time of first flight and his death in 1912? It wasn’t great because he was constantly fighting—trying to prove that he had flown. Then [Wilbur and Orville] also had to get new prototype Flyers stable enough to monetize them and sell them to the Army and other countries. 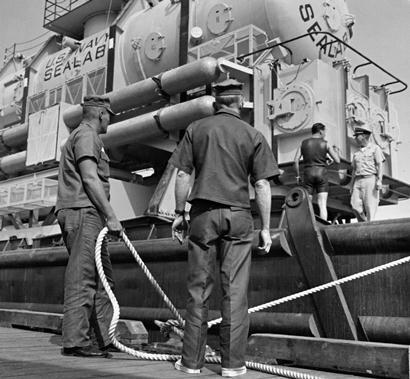 The early Flyers were very unstable so they had to keep working and conduct all these tests. They also had patent wars. [The Wright Brothers] said ‘We are the guys who invented flight and everybody else who has a plane has to pay us a royalty.’ They finally got a court to agree with them, but enforcing that was impossible so he was in litigation with Glenn Curtiss up until the end. When he died Orville blamed Curtiss and others for stressing Wilbur out so much that it killed him. So Wilbur’s happiest days were at Kitty Hawk. That was his laboratory. After that came a lot of stuff he didn’t like, including business and litigation and trying to monetize the airplane, which, of course, no one had ever done before. He died pretty exhausted. What about Orville’s quality of life? Orville became very wealthy and bought a big house but became a little reclusive after Wilbur died. He had a secret affair with his secretary, Mabel Beck. He lived the life of a famous man who was “hanging out”—living an inventor lifestyle and enjoying the fruits. But he was also in a big fight with the Smithsonian over who invented the airplane, and that took over his own life. Ball and Cane—The rise and fall of gutta-percha.